If DTC P0014 is displayed with DTC P0078, first perform trouble diagnosis for DTC P0078. Refer to EC-183, "DTC Logic". If DTC P0014 is displayed with P1078, first perform trouble diagnosis for P1078. Refer to EC-359, "DTC Logic". P0014 EXH/V TIM CONT-B1 (″B″ Camshaft position - timing over-advanced or system performance bank 1) There is a gap between angle of target and phase-control angle degree. Before performing the following procedure, confirm that battery voltage is between 10 V and 16 V at idle. Let engine idle for 10 seconds. Is 1st trip DTC detected? YES >> Proceed to EC-174, "Diagnosis Procedure" NO >> GO TO 3. Check the exhaust valve timing control solenoid valve. Refer to EC-172, "Component Inspection". NO >> Replace exhaust valve timing control solenoid valve. Refer to EM-48, "Exploded View". 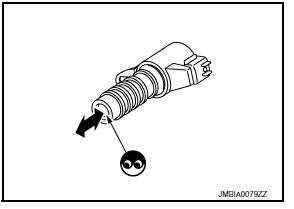 Check the exhaust valve timing control position sensor. Refer to EC-282, "Component Inspection [CMP Sensor (PHASE)]". 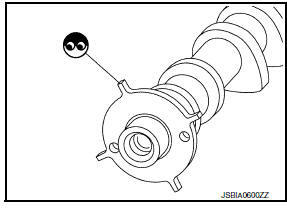 NO >> Replace exhaust valve timing control position sensor. Refer to EM-48, "Exploded View".